Taylor: The other day I was in a tabletop game store and played a great game called “Clank!” It was so fun that I ended up buying it, but not before having to choose between the original version, set in a typical fantasy setting, and another version set in space. I went with the original because it suits the game better, but it reminded me that I’m a sucker for anything re-imagined in space. That being said, I was super excited to learn about a new Black Panther series set in outer-space and am delighted to say that after reading the first issue, it doesn’t disappoint. Long ago a group of Wakandans left their home country and set off to colonize the stars. Eventually, their colony turned into an empire that spanned the cosmos and is now looking to conquer Earth. Without any preamble, T’Challa finds himself in the clutches of this evil empire as a slave. Well, to say he finds himself might be a bit of a misnomer, for T’Challa has no memory of who or what he is. As he learns towards the end of the issue, this is because the Imperials wipe the memory of every person they capture and enslave. Drawing the parallels between T’Challa’s enslavement and that of black people by white colonizers is not hard to do, and that’s almost certainly on purpose. Like T’Challa, black slaves had their names, families, and homes taken from them. While they may not have forgotten these things, they might as well have, given that most were destined to never see them again. Effectively, this makes T’Challa’s turn in space a retelling of the story of black slavery and rebellion. It makes sense that Ta-Nahisi Coates would do this. Coates is first and foremost a social and political writer who shines his focus, and considerable writing skills, on the issue of the black experience in America. His run on Black Panther is memorable, if for no other reason, than the fact that he is a “literary” figure writing for a comic series. As expected, this means Coates is using the opportunity to not only tell a ripping good yarn, but to send a message that will resonate with readers. That balance shows that art can be both moral and entertaining at the same time. So this story of T’Challa in space is easily translated onto the experience of slaves in America. We saw this already with his name and history being erased, literally, but there are other examples of it as well. Earlier in the issue, T’Challa gets into a fight with another slave and, having not forgotten his ability to fight, mops the floor with him. However, his victory is shallow because of the words of a wise, older, slave. He urges T’Challa to be more than what his enslavers think him to be. In other words, he needs to act the part of a king and not of a beast who would lunge at the closest victim. This old slave’s imploring is a reminder of what slaves (and minorities in the current age for that matter) have to go through — walking the fine line between fighting for your rights and playing into the behaviors their oppressors want to see to justify their actions. It’s not only Coates’s script which addresses the issue of slavery, though. Daniel Acuña’s art is back on the Black Panther beat, and his impact on the story is immediately apparent. Throughout T’Challa’s time as a slave, he is constantly antagonized by Imperial guards, the Askari. These guards are brutish and treat all the slaves like crap, just as their appearance suggests. While their matching looks and personalities are a boon to the issue, what’s striking is how dehumanized these guys are. Sure, they’re aliens, but the design of their costumes seems to purposefully mask any sense of humanism or individuality any of them might have. Just look at how those helmets mask their face, eyes, and head. Paired with their matching uniforms, they might as well all be the same guy. This design by Acuña is brilliant. Throughout the issue T’Challa is shown in various situations which are intended to take away his humanity. He has his memory wiped, he name taken, and he is forced to work as part of a faceless task force. Despite all this, T’Challa refuses to give up his humanity to his enslavers. He asserts his freedom and individuality, by force if need be, whenever he can. This is in stark contrast to the guards who voluntarily give up their humanity for a paycheck. By doing this, Acuña is asserting that slaves are more human than their captors. This statement rings true the more it’s analyzed. Michael, I loved this issue. Again, I’m a sucker for stories set in outer-space, but there’s more to this issue than just that. Coates and Acuña are using the space setting to tackle some heavy issues and aren’t just using it as a gimmick. So you know my opinion, Michael, but what’s yours? Does space = exciting for you too? Is there anything else about Acuña’s art that caught your eye? Michael: Taylor I had been thinking about your question of “Does space = exciting for you?” — especially in reference to the character of Black Panther. Would the “in space” work just as well if it were a Marvel hero other than Black Panther in space? Probably? Of course it depends on the creative vision behind the concept. I think that Black Panther’s recent rise to popular awareness has positioned him to be the kind of character who could most easily transition to space. Many of us — myself included — are not acutely familiar with the particulars of Wakandan lore. Ryan Coolger’s Black Panther film brought a lot of that history to the mainstream, giving us all a basic idea of understanding of that world. Given that, there might not be as much apprehension putting a “new character” in space. And the Black Panther diehards are here to see T’Challa “Wakanda Forever” forever, so they are just fine. If Marvel threw Spider-Man into space for a brand new #1 issue, we’d likely see a decent amount of outcry from overprotective readers. “BUT WEB FLUID DOESN’T WORK IN SPACE!” and so on. Instead, we are given a “reboot” of Black Panther where there are familiar characters and government structures that have been inserted into new roles. Taylor mentioned the basics of the new world order above: The Wakandan Empire is basically Star Wars’ Galactic Empire and T’Challa has been reduced to a slave. 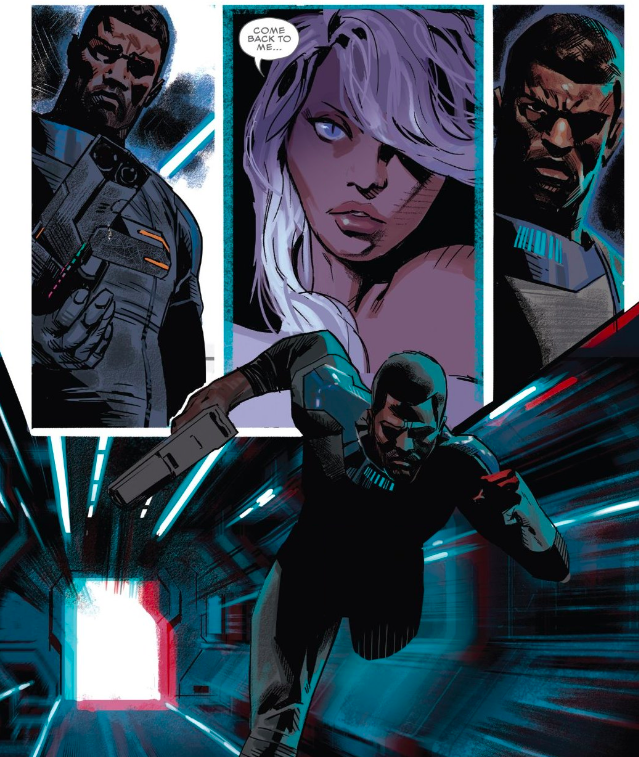 “The Mackandal” — the group of rebels that come and rescue T’Challa — are led by Nakia and M’Baku. Both characters were also prominently featured in the Black Panther film. 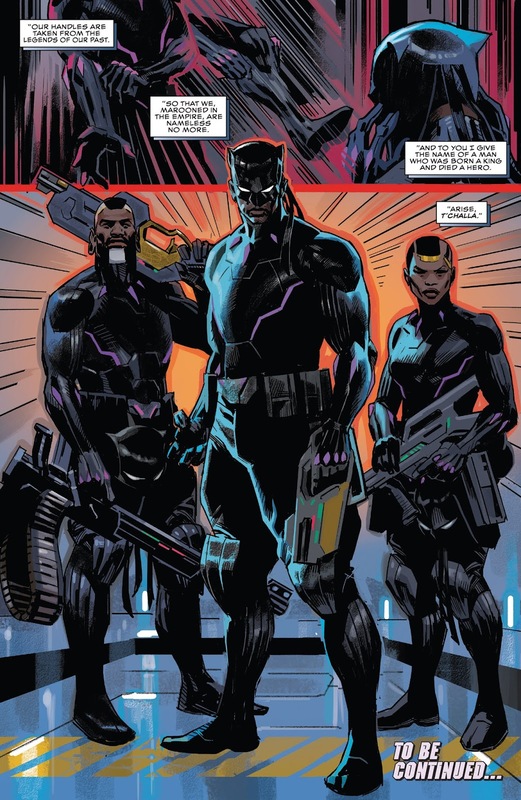 Finally Daniel Acuña’s character design for the Black Panther armor the Mackandal wear is reminiscent of that of the film’s — but works a little better in a sci-fi setting. Again, I get the feeling that Coates is taking advantage of the imagery from and familiarity for the Black Panther film to ease us into more unfamiliar territory. It’s unclear how T’Challa and Wakanda ended up in the places they are, but throughout the issue, Coates drops hints and nods to the Wakanda that we know and love. As a slave, he is nameless, but when he joins up with the Mackandal at the end of the issue, he is bestowed with the name T’Challa by Captain N’yami. Does N’yami know that this man is actually the legendary T’Challa? Was T’Challa actually “born a king and died a hero”? Another curious runner throughout the issue are T’Challa’s dreams of his former life — something that N’yami herself is also familiar with. T’Challa’s dreams consist of a white-haired woman lying in bed with him urging him to come home. I am pretty confident that this is the X-Men’s Storm, Ororo Munroe — but I’m even more confident that this once-royal couple has been divorced for some time now. Maybe Coates is a Storm/T’Challa ‘shipper? I’d be down with that. More realistically, his ex-wife — who was at one point an integral part of his life — is still embedded in his subconscious, asking him to remember who he is. Acuña’s talents are well-suited to the sci-fi realm, with a combination of reds and blues that remind me of the 3-D comics of yore. Though Coates’ dialogue certainly propels the narrative, a lot of the work is done by Acuña — given the fact that T’Challa is mostly silent throughout the issue. His line work calls many things to the reader’s attentions. Acuña indicates when T’Challa or the guards are alerted to a change in their surroundings with simple white lines emanating from their heads. 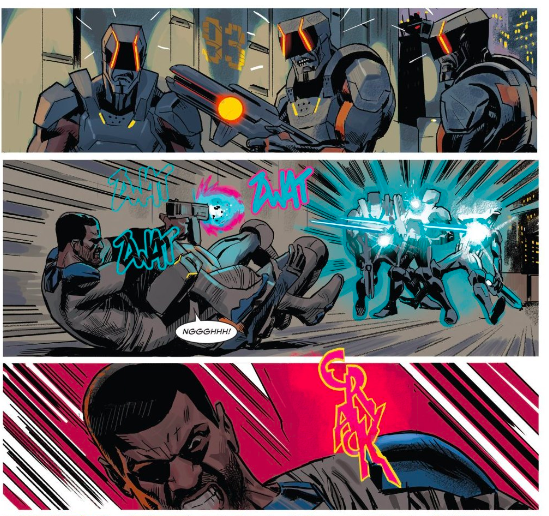 T’Challa’s swift kicks, punches and throws are accompanied by a blur of lines and color that heighten their motion. Heightening best describes what Acuña adds to Black Panther 1: he makes every action — great or small — feel important. 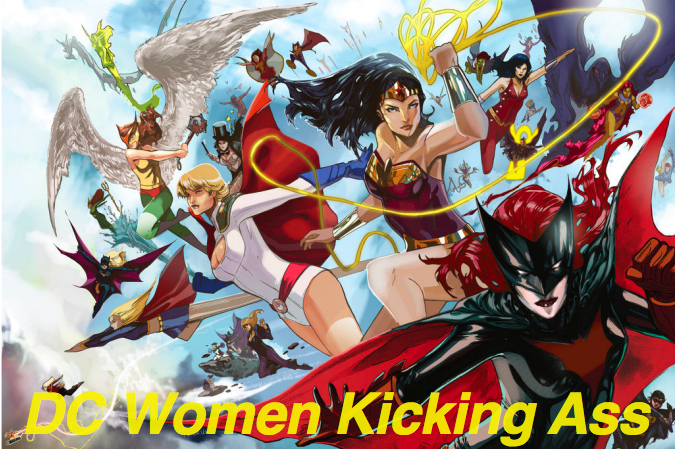 Waking up from a dream is given just as much emphasis as a sweeping leg kick. With whiffs of the film, Black Panther 1 is a little bit X-O Manowar and a little bit Star Wars with some cultural commentary to boot. It’s a bold new start for Wakanda that I think requires very little prior knowledge of prior Black Panther continuity — Coates’s run included. I think we have the start of a masterpiece. I have been harsh on Coates’ Black Panther. He improved towards the end of his run, but there were still large problems. But this is truly amazing. A massive improvement on all measures. Reminiscent of his fantastic Black Panther and the Crew, but better.Part of this is down to Acuna, I think Coates is finally paired with an artist that can elevate his work. But most of it comes down to Coates making some very clever choices. I think going more out there with genre suites him. Political thriller sounds natural to Coates, but Space Opera forces him to make the political aspects that were always inescapable as subtext. This allows all the depth you’d expect from Coates, but a need to focus the actual text on the basics of decision based storytelling that political monologues often forget (though it may laos be COates just learning more and more as he writes. The FCBD Captain America story was very high quality from Coates). But it ins’t jsut that Coates is finally writing the genre that better suites him. It is the exceptional formulation of taking Star Wars (which, remember, begun as an anti-Vietnam movie) and rewriting the metaphors into one of the most exceptional metaphors of the Trans-Atlantic Slave Trade I’ve seen. And so, we get to the key, important idea of this comic. This comic is not a Black Panther comic. It does not have a single character from the Black Panther comics, except flashbacks to Storm (Michael, I don’t know if you read all of Coates’ last run, but T’Challa reconnected to Storm at the end. Which is a shame, as I prefer this romance with Monica Lynne). I would bet money that Emperor N’Jadaka is not just a namesake of Killmonger but the actual Killmonger (when I first heard of this story, long before this issue shocked me with how different it was to what I thought it would be, I thought Killmonger would be the villain. Like in the movies, Killmonger’s deal is a wish to bring American style Imperialism to Wakanda. The big difference is that instead of an interest in Imperialism for the goal of black liberation, the comics Killmonger worships capitalism. Which is to say, he would be the perfect villain for an arc about the Wakandan Empire). But every character in this issue is original. Even our lead is not our T’Challa. Without his memories or his personhood, he has more in common with Luke SKywalker and Rey than he does with T’CHalla. His lost memories are essentially the Force, though instead of being a metaphor for self actualisation and learning your place in a greater society, the fact that our hero used to be a noble king and a brave superhero is a metaphor for the inherent nobility and dignity of Africans that were suppressed by the slave trade. The fact is, our hero is a completely different archetype to the traditional T’Challa. This is essentially not Black Panther. So why is it in a Black Panther book? Because Black Panther is being used as a meme. A word that I am using not in the internet meme sense. But in the idea of a cultural element that is passed through and propagated from individual to individual. Iconic characters adn franchises are fantastic examples of memes, which is why the SUperman symbol is the second most recognised symbol in the world. And so, Black Panther is used as a meme to represent Africa and African culture. Storm’s presence in T’Challa’s memories reflect how T’Challa has been split from his history. He will forever be connected to Africa, just as every African American has a connection to Africa and Africa’s history. But it is a connection that has been hacked and destroyed by the Wakandan Empire/America’s imperialism. Just as African-Americans don’t know where from Africa they descended from before their ancestors were enslaved, T’Challa has this connection to a past but no context to what it means. He does not know who Storm is, but that link remains. Of course, it is problematic to use an American comic book mythology that made up its own fictional nation to represent Africa. As a cultural meme, Black Panther is a distinctly American meme. While, especially thanks to the efforts of creators like Christopher Priest and Ryan Coogler, I would say that Black Panther is a distinctly African-American meme that holds special meaning in the way in which he engages in their shared history, it isn’t perfect. But Coates is writing Black Panther, and he can’t escape the fact that he will, in the end, has to do the best that he can do with the characters he has. And he uses them really well. And honestly, replacing Black Panther with a distinctly African meme wouldn’t work. And a large part of this comes down to the Black Panther movie. T”Challa, Nakia, M’Baku are household names, names we recognise and whose memetic impact matters. And if, at the end of this comic, our hero was given the name of Shaka Zulu, the impact wouldn’t be the same. And to try and find an African meme that also had the same characterisation as T’Challa, the impact would be even less. Which leads to an interesting point about N’Yami, M’Baku and Nakia. These aren’t the real N’Yami, M’Baku and Nakia. Hell, N’Yami died a week after giving birth to T’Challa, and the N’Yami we meet isn’t even human. The name is used, because of the impact of this character in this place in the narrative having the name of T’Challa’s mother. As, I believe, M’Baku and Nakia are used because, with the exception of one small cameo from M’Baku, Coates hasn’t used either of them in his previous run as he has been interested in different villains. But M’Baku and Nakia are names that, as memetic moments of culture, the Black Panther movie has given distinctive meaning. Different meanings than in the comics, where both are supervillains (though Priest’s M’Baku is not that different to what M’Baku was in the movie). ANd because of what we associate from those names because of Coogler’s movie, we, as the audience, feel the impact that these characters got from asserting their own identity and reconnecting to the past that has been stolen from them (it will be interesting to learn what these characters know about the real Wakanda. Is the legendary T’Challa they named T’Challa after the same T’Challa from the comics. What do they know about the real M’Baku? Or the real Nakia? Star Wars, but with the EMpire running the Transatlantic Slave Trade is a fantastic premise. A way to take all of the power that Space Opera has provided and direct it at the horrors of slavery. But what makes this a masterpiece is the focus Coates has on the effect of slavery spiritually. It isn’t just the focus of physical subjugation or simplier elements of oppression. It is the brutal removal of culture. The mind wipes aren’t just about the way that the slave’s lives were taken from them. It was about how the slaves were stripped from their culture. The true horror of the mind wipe, just like the true horror of slavery, was that no matter what happened and no matter how much was done to fix it, they would never be African again. And so, our Luke Skywalker/Rey starts their journey as the latest Space Opera hero. But his Empire is not one of attacking Vietnam, but one of enslaving Africa. And so, our new hero finds his power not in the Force, but in the culture that was stripped from him. Power by healign that spiritual wound and seeking to replace what was taken from him. And the fact that our hero is secretly the real T’Challa? Of course he is. Because no matter what , no matter how much you try to kill their connection to their culture, one thing will always remain. He is African. He always will be. You cannot ever take that away. Man from the sound of it I wish he would write inhumans but that’s just my opinion. I’ve said before that Black Panther is the franchise closest to the Inhumans, and the Inhumans should take inspiration from what writers like Coates and Priest did with Black Panther. Which was why hiring Christopher Priest to do a miniseries was only a bad idea because he wasn’t given the main book. Well if you a writer that writes a book that is too similar to your previous work how you can differentiate it and make it unique? It would all be about finding a different approach that plays to your strengths but approaches the topic from a different angle. For example, Coates’ Black Panther is about the struggles of a good man to be king in a nation facing a range of domestic political crises. If Coates was to write Inhumans, there are several approaches he could use to differentiate it while remaining true to his strong political perspective. Firstly, he could do a story about the struggles of a good man to be king facing a range of foreign policy challenges. Focus less on Inhuman threats, and focus more on the Inhumans’ relationship with America, with the Kree, with the Universal Inhumans etc. Foreign policy and domestic policy is sufficiently different that Coates should be able to make Inhumans distinct. I have an Inhumans pitch that is very similar to that, actually. Lastly, you could shake up the leadership and put a villain in charge. Tell a story about living under a bad ruler. As the writer of ‘The First White President’, Coates could get a lot of depth out of this. Maximus could be used as a Trump style figure, ruling completely according to his whims and lashing out at perceived opponents. Lots you could explore hear around ideas like threats to free press etc. Though I think this is the least interesting option. I’d be more interested in the Unspoken, maybe. Though the Unspoken has problems with the fact that it is hard to come up with policy that would make him a bad ruler – his signature policy that led the Inhuman society to rebel against him was essentially the abolition of slavery. The other option would be to go for an authoritarian populist. Built more around fearmongering, maybe with an isolationist bent and an increase in hostilities with humans. Maybe turn Inhuman society against the impure Nuhumans? And of course, the Universal Inhumans would be a useful here. THere would be Trump inspirations to this as well, but I’d stay clear of Trump specifically and his unique quirks. Focus just on the authoritarian aspects, which are not at all unique to Trump.